For those days when even the snow angels are shivering, it’s good to have an emergency list of indoor boredom-busting activities for kids other than the TV. See if any of these activities might appeal to your little ones. Try a few experiments. You can build a classic sparkly volcano, with baking soda, vinegar and glitter in a vase, or write secret messages with invisible ink made from lemon juice. Many more ideas are available online. 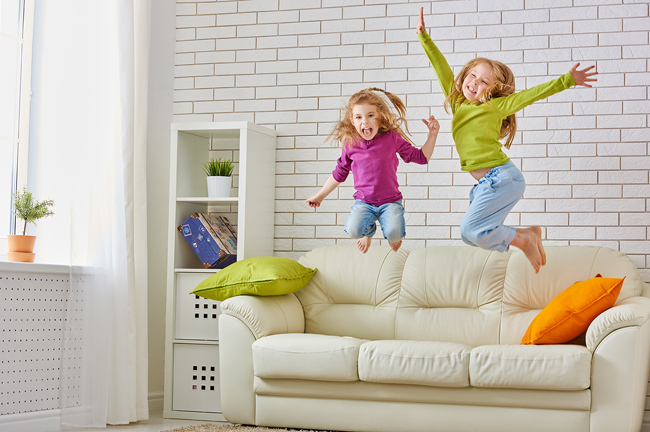 Incorporate furniture, cardboard boxes and jump ropes in obstacle courses kids can run against the clock. Hardwood floors are perfect for indoor bowling. Stack plastic cups in a pyramid and try to bowl them over with rolled up socks. Have kids create cards or write letters to out-of-town friends and relatives — or even public figures they admire! Create a scavenger hunts for kids. You can find some ideas here. Kids love to get creative in the kitchen, especially with foods that can be extensively “decorated” such as pizzas and cupcakes. Add another level of fun by recording the process and splicing together a mini-cooking show for relatives. There are a zillion types of coloring books available for kids. Lately, coloring books have also grown in popularity with stressed-out adults. Sit down with your kids and try to stay in the lines — or not! Move the furniture and clear space for the kids to boogie down. Music services like Pandora can help you find just the right tunes to get kids moving.